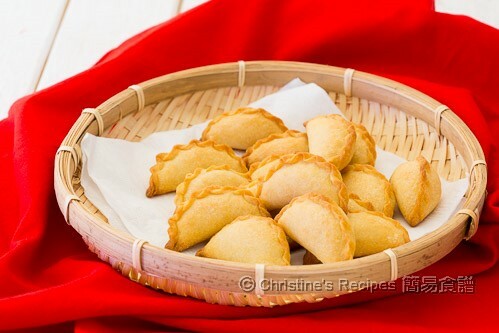 Way back when I was small, I would consume quite a lot of deep-fried dumplings (you jiao 油角/角仔) during Chinese New Year (CNY). 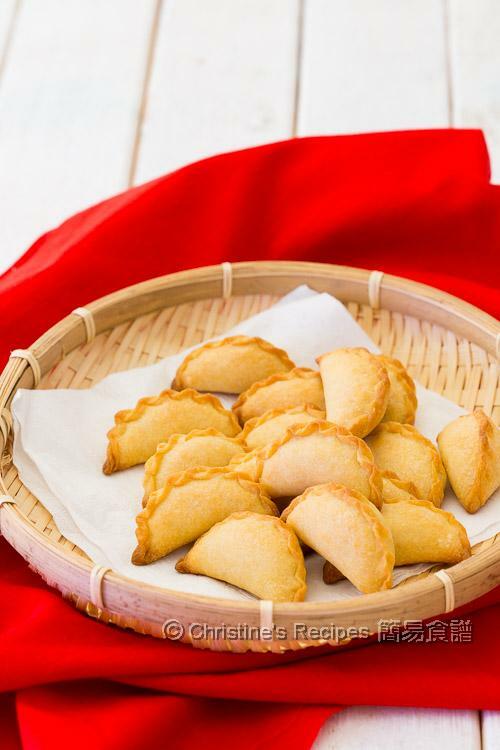 I still remember that my parents tried every effort to remind me not to eat too much as the deep-fried dumplings are “yeet hay” (“熱氣” in Cantonese Chinese, literally means “hot air”) which basically means not good for health. They didn’t want me to consume too many oily foods either. Since I moved into Australia, I haven’t bought any for celebrating CNY at all for so many years. Until a while ago, an idea of baking some CNY dumplings came from nowhere. Then off I went to test the idea and made these baked dumplings with desiccated coconut and roasted peanuts inside. The traditional ones are mainly made of plain flour and lard. After deep-frying, the crust will turn golden brown, crispy, brittle, and a bit harder than cookies. 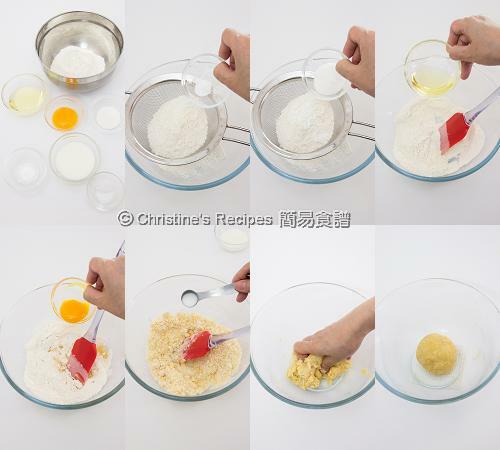 I wanted to get my baked dumplings similar to the texture of deep-fried ones, thus I chose bread flour (i.e. high protein flour), adding a little of baking powder. The end results were satisfied. They were crunchy and delicious, yet guilt-free and less oily. Once the dumplings were out from the oven, my husband took three of them in a row and commended my efforts. Top left: fillings. Bottom right: Seal and tuck the edges. Sift the bread flour, baking powder, sugar and salt into a large bowl. Combine well. Stir in the oil. Add the egg yolk. Pour in the milk and knead it into a dough, reserving about 2 to 3 teaspoons to add in bit by bit in order to get the right texture that is similar to the softness of your earlobe. Roll into a ball shape. Cover and let it rest for 15 minutes. To prepare the fillings, mix all the ingredients together. Set aside. On a clean surface, use a rolling pin to roll out the dough to a thickness of 2mm. 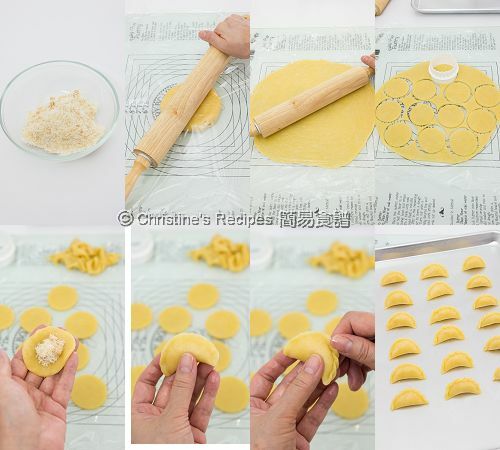 Use a cookie cutter to cut out small discs. Place a teaspoon of fillings in the middle of a dough disc. Fold in half, seal the edges tightly, and tuck the edges inwards to form patterns. Place it on a lined baked pan. Repeat this step to finish the remaining dough. Bake in the preheat oven for about 18 to 20 minutes, or until the surface turns golden brown. Remove from oven and let the dumplings cool on a wire rack. The leftovers can be stored in an air-tight container for up to one week. Don’t over-knead the dough. Just knead all the ingredients together until it’s smooth and soft. When place the dumplings on the lined baking pan, let them “stand” on their bottoms. Then you don’t need to flip to other side in the middle of baking. 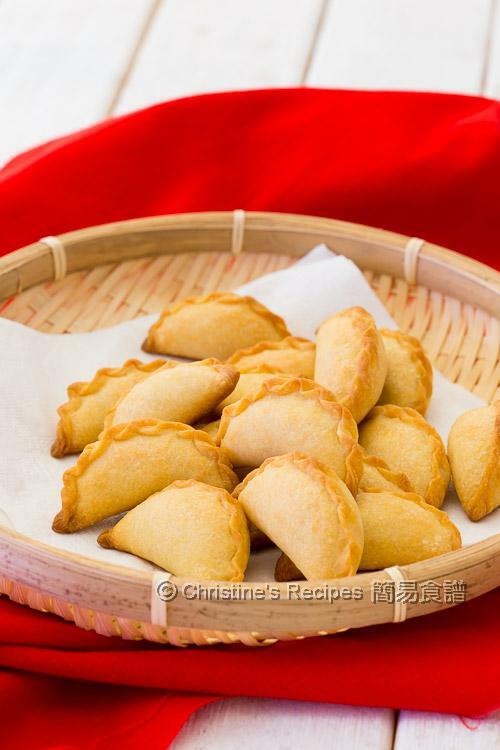 If the weather is humid and the baked dumplings turn soft, bake them in a low-temperature oven. They will return crispy. Happy New Year, Christine! Besides turnip cakes, these peanut dumplings are my favourite CNY treats. Gong Xi Fa Cai! I have to save the recipe since it seems not so complicated. It sounds quite easy to make will give it a go. Thanks for the recipe.